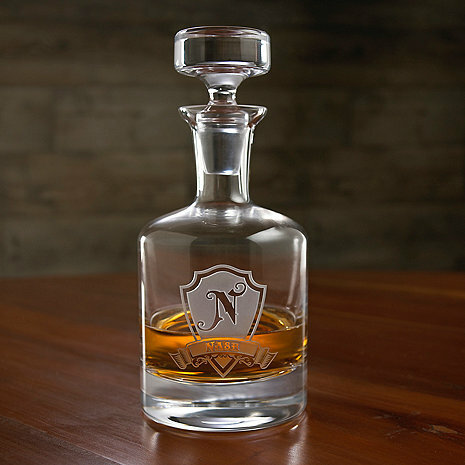 Our Personalized Shield Whiskey Decanter is custom engraved with an old world European style shield featuring a monogram initial in the center and an elegant name banner engraved under the shield. Our custom decanter is the perfect groomsmen gift, birthday or wedding gift. Our master glass carvers deeply carve each decanter using our sand carving technique, so that each of our decanters is meticulously custom made to order making this the perfect gift for those seeking unique gift ideas for whiskey lovers. BEST ANSWER: The Personalized Shield Whiskey Decanter is made in Europe and etched in the USA. Can I do this shield engraving on a different decanter? BEST ANSWER: Im sorry this engraving style is only available on the shield decanter. Could you provide a mock up with this font? BEST ANSWER: Thank you or your question, this Shield Decanter is only available in the font as shown, We have many other decanters that can be personalized, please contact out consultants at 800-822-8846.